Mother nature can be diabolically cruel sometimes, but that doesn’t mean she doesn’t have a sense of humour. Take these strange animals for example. Each of them looks like one of nature’s practical jokes and made millions of internet users squeal “fake, fake, faaaake! !” They are, however, totally real. The Gerenuk, Litocranius walleri, also known as the Waller’s gazelle, is a long-necked species of antelope found in dry thorn bush scrub and desert in East Africa, from Somalia, Djibouti and eastern Ethiopia through northern and eastern Kenya to northeastern Tanzania. The word gerenuk comes from the Somali language, meaning “giraffe-necked”. This strange animal is the sole member of the genus Litocranius and we are proud to give it 4 out of 5 stars on the bizarro meter, simply for looking like a perfect giraffe, gazelle photo-mashup. What seems like a CGI scene lifted from Jurassic Park is in fact a flightless bird called the Cassowary. Not only is this the world’s deadliest bird, but it’s also one of the most dangerous things you can bump into in Australia period, which is saying a lot when 90% of the wildlife there is capable of destroying you. This Ostrich from hell takes protecting it’s territory very, VERY seriously, and will brutally murder anything perceived as a threat (you!) with it’s razor-sharp claws. They can reach heights of up to 7 ft and there are many records of natives being seriously injured or killed by this, finely-tuned, writing machine of death. Oh… and if you think I’m exaggerating then be sure to check out the video. Welcome to Australia, the only place in the world where you can get disemboweled by a bird! #4. The Giant IsopodWhat would happen if these two had a baby? The only uplifting thing to say — after realizing that such a horrifying thing exists — is that it seems to have a taste for Doritos, rather than human brains. This strange creature is related to the common Pill Bug and, according to fossil record, have existed for over 160 million years. Even though it looks like these creatures could easily take over the world if they wanted to, they are actually quite harmless, deep-sea scavengers. Have you ever wondered what would happen if an antelope had a baby with the alien from Star Wars’s Mos Eisley Cantina? The Saiga Antelope is one of the world’s most ancient mammals, having shared the Earth with saber-toothed tigers and woolly mammoths, 250,000 years ago. Thought to be extinct at one time, they are also referred to as living fossils. I know what you’re thinking… This is either a Photoshop or someone threaded a snake through a turtle. But this is in fact a Smooth Long Necked Turtle. A species of turtle with such long necks that they aren’t able to pull it back into their shell, which is basically the only good thing about being a turtle. They do have skunk superpowers though and can produce a offensive smelling liquid if threatened. Do you believe in alien life and/or UFOs? Follow us on Facebook, Twitter, Pinterestand/or Instagram! In this case I suggest you just watch the movie as no words can do this ridiculously cute animal justice. Living at a depth of 7,000 meter below sea level, the Dumbo octopus is the deepest-living octopi discovered. It sure is good to know that after miles of vertical water and untold horrors, deep sea creatures start to turn into Disney cartoon characters. Most frogs can fit in the palm of your hand, or even on the tip of your finger. But the Goliath frog, the world’s largest frog, may grow up to 3 feet long when it is stretched out and can weigh as much as a newborn baby, about 7 lbs (3.2 kg)! The goliath frog is normally found in and near fast-flowing rivers in Cameroon and Equatorial Guinea. They feed mostly on insects but smaller frogs or snakes best be on the lookout for this behemoth as they are also known to end up on its menu. The Zebroid is actually a cross between a horse and a Zebra, so why isn’t it named Hobra? We don’t have the faintest idea, but Zebroid does have a nice ring to it. This weird but amazing looking fish is considered a delicacy in many parts of the world. In Polynesia, it is served raw and was once considered “royal food”, only eaten by a King. Now, I understand that this photo doesn’t even look like a good Photoshop and more of a Windows Paintat best. But please keep in mind that some species of Parrot Fish can envelope themselves in a transparent cocoon (which is made from an organ on their head). They do this to hide their scent from predators and, obviously, to look like a Pixar cartoon animal. I Know what you are thinking… That has to be either a Photoshop or a toddler planking while wearing a bat costume. The truth, however, is far more frightening… This creature is called the “giant golden-crowned flying fox” and is one of the largest bat species in the world! They are extremely rare and confined to the forests of the Philippines. Also they feed primarily on figs- and not hapless teenagers, who manage to get lost in the woods, as you would expect. When I first laid eyes on this amazing animal, I wasn’t sure if this is the cutest or the most horrifying thing I’ve ever seen, until I learned the back-story. First horrifying detail: it’s real and the man is of average height, not Hobbit size. Second, is that this species of giant gray bunnies are bred by a guy in Germany for food. Brooklyn Supreme was a Belgian stallion noted for his extreme size. He stood (78 inches, 198 cm) tall, weighed 3,200 pounds (1,500 kilograms) and had a girth of over 10 feet (3 meters). He was basically the SUV among horses. #17. The Largest “Gold Fish” Ever Caught! For something that looks like it can only be killed with a flamethrower, they sure gave this “Coconut Crab” an innocent sounding name. 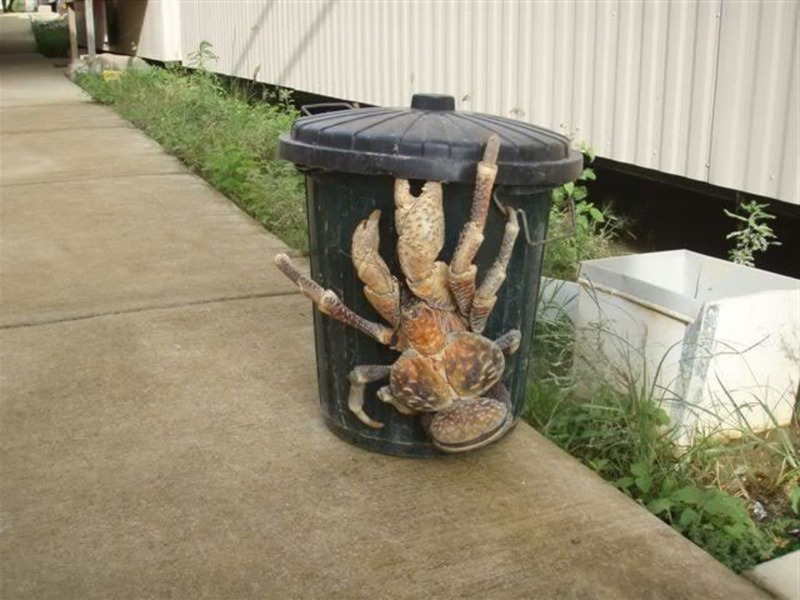 Weighing up to 9 kilos, the Coconut crab is the largest example of arthropods in the world. As the name suggests, the animal are known to climb trees to pick coconuts and then crush them with their powerful claws. Considered a delicacy by some, these crustaceans are protected in some areas. Enjoyed this post? Share it with your friends on Facebook!